Industry Context … New product development (NPD) is becoming increasingly complex. Top management is pushing for faster development cycle times and accelerated market launches within an environment of limited resources, cost constraints, increasing regulations and consumer demand for innovative products. Add to these pressures, the prevalence of mergers and acquisitions (M&As), especially in the CPG (consumer packaged goods) and pharmaceutical industries. Research shows us that these combinations result in composite R&D, Marketing, Sales, and Manufacturing organizations with personnel from both legacy companies each with experience in different processes, social networks and ways of working [1,2]. Often after a merger or acquisition, the new Senior Leadership Team quickly determines the new direction, strategies, mission, values and vision for the new company and tries to implement them using a “tell-sell-yell” approach. The soldiers are told when and where to march but their heads are still spinning as they adjust to new leadership, new colleagues, new locations and confusing processes. In many cases, these change management efforts achieve limited success resulting in frustration among upper management, and internal resistance to change. By the time the folly of such attempts is recognized, serious damage has generally become systemic and the life-blood of the new company – its “pipeline”- is frozen. The R&D Post-Merger Situation … The integration of two legacy pharmaceutical R&D organizations into one new global R&D organization initially focused on two distinct areas: 1) compliance and 2) understanding the overall process for delivering R&D products globally. The two merging companies had different NPD processes, documentation, governance systems and standard operating procedures (SOPs). These differences and the subsequent operational confusion they caused potentially threatened to cause significant delays in bringing new products to market. The challenge was to quickly develop an integrated NPD process utilizing the best or most appropriate practices of each legacy company, with one set of SOPs, a common set of documentation and a single governance process. The integration presented a good opportunity to optimize and improve NPD cycle-time and speed to market. The only way to meet the challenges of such a complex and ever-changing commercial environment and win the Innovation game is to continue to be the first and best at bringing new products to market. SOP Rationalization … At the outset, one legacy company had more than 500 R&D SOPs and the other company also had several hundred. Teams reviewed and analyzed the SOPs and where possible, mapped SOPs from one legacy company to corresponding SOPs of the other. In these cases, where appropriate, a new integrated SOP was developed. In some cases, multiple SOPs were consolidated into one new SOP. Others were eliminated because they were no longer relevant. Finally in some cases, additional SOPs were developed to close gaps. These new, consolidated and rationalized SOPs could now be incorporated into the process maps. NPD Process Mapping and Web-enablement (Main Deliverable) … The company needed a clear and easy way for all NPD participants and stakeholders to follow a complex process that described many hand-offs between different functional groups (which in many cases were newly-formed, reorganized or contained additional new personnel). The goal was to document and communicate an integrated NPD process that linked low level functional process maps to the high level governance process, and do this through co-creation with all functional subject matter experts (SMEs) of both legacy companies. The resulting deliverable used a multi-leveling methodology that incorporated internal hyperlinks between levels and hyperlinks to appropriate content within the client’s intranet as well as to the external internet. Because bringing a new product concept to market requires more than 1,000 – 3,000+ process steps across many functional groups, a simple visual representation of the steps is essential to ensure clarity of roles, responsibilities, dependencies and hand-offs. A consistent numbering scheme, iconography, process map layering and hyperlinks to additional content all ensure a common understanding across the new organization. One of the major deliverables of this project was the development of a web-based intranet tool, available to all colleagues throughout the company. The tool enables users to “drill down” from a high level overview of the NPD process to increasingly detailed sub-processes. At the more granular levels of the tool, the user can refer to appropriate SOPs or other appropriate content including presentations, document templates, examples, or internal or external websites containing content appropriate to that process. Unique Interview Approach … What was unique about this project was the interview approach that we used in developing the process maps. We ensured that the maps included the best from each legacy organization. 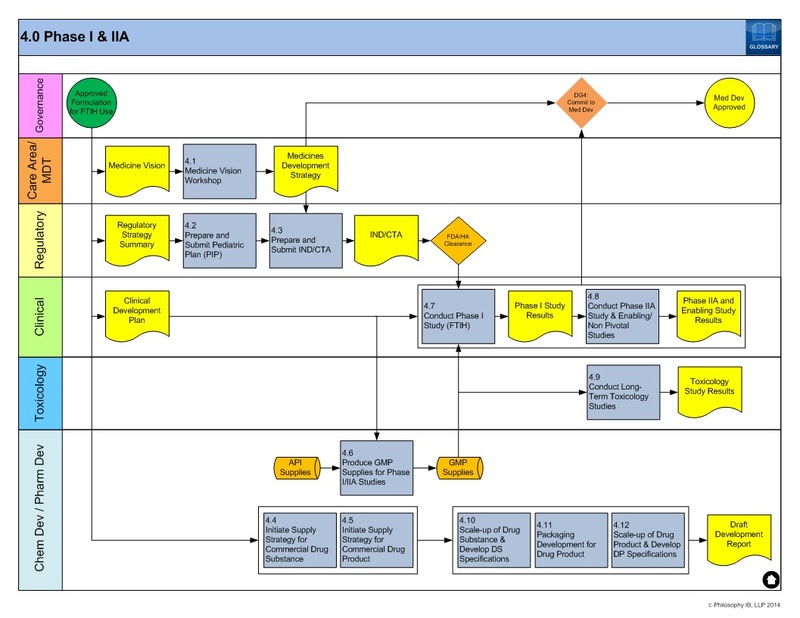 Unlike so many process redesign efforts that are largely “top down” with minimal input from SMEs, here the process maps were built from the bottom of the organization up. This helped us tap the knowledge of those actually doing the work, but also built consensus and buy-in to the new process. Colleagues in different functional groups were interviewed, one-on-one, for multiple rounds to validate maps at the functional level. Next the maps were validated at the functional group level, then at the cross-functional group level and finally with the whole organization. 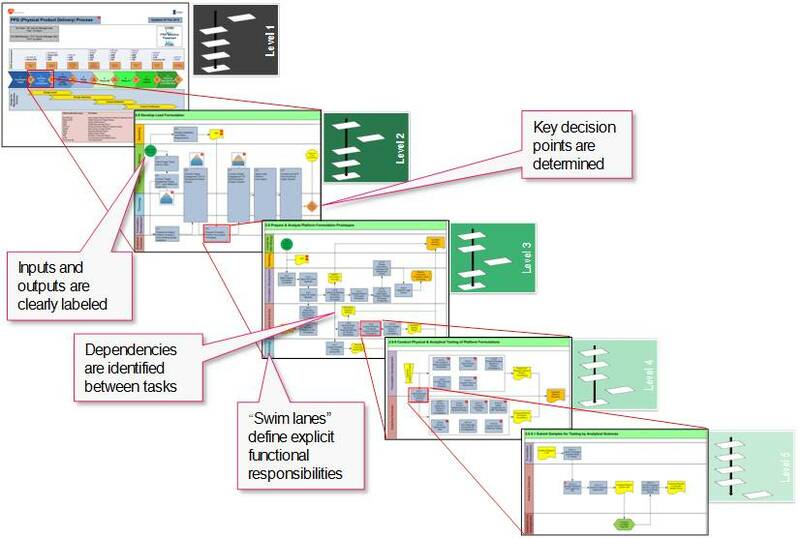 Each interview session was conducted using “straw man” draft process maps that were edited live. Using this approach we were able to ensure that almost everyone in the organization had a hand in developing or validating the maps. Additional Deliverables … In addition to the process mapping initiative, but before NPD cycle-time reduction can be considered, it was necessary to include baseline project estimates for each process and sub-process. 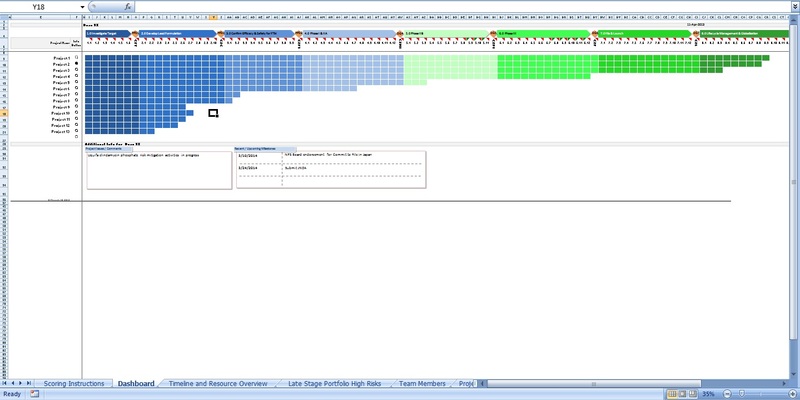 To address this, a Gantt chart template was developed which corresponded to processes outlined in the process mapping tool. In this way, realistic project timelines could be developed in conjunction with the entire project team. We also developed a project management dashboard so that the entire portfolio could be followed easily. Don’t Forget Implementation … Of course successful implementation of the final deliverables is critical to restoring R&D productivity. Without a strong and effective roll out program, the changes will not stick and processes and behaviors will revert to the old legacy ways. On-going training on the final deliverables is really important for on-boarding new hires and transferees from different parts of the company. Periodic update training for all employees is also a good idea. Incorporating knowledge and use of these tools in performance goals also solidifies these changes. Summary … The way R&D groups adapt after mergers is critical to how quickly they get back to full speed in NPD development [4,5]. There is no doubt that M&As negatively affect R&D performance and that loss of knowledge, loss of motivation, lack of decision making, lack of defined processes and reorganizational chaos all contribute to the pipeline becoming frozen (or moving in slow motion) for a period of time. Process mapping initiatives using the methodology and interview approach described in this post help to resolve R&D performance issues and result in a more productive R&D with less down time after a merger. In my next two posts I’ll talk about the project’s effects on change management and innovation culture, and discuss some “lessons learned”.